I just love Maundy Thursday. It is not a very well known or much celebrated day, but for us Lutherans, it is always a part of the Easter Season. It was the celebration of the Last Supper - a way to remember the beginning of our Communion services - the time when Jesus and his disciples celebrated Passover together. It was also the night that Jesus was betrayed and arrested. This was all enough for me to appreciate those church services on Maundy Thursday. For me it was a time to feel especially close to those first disciples, and to Jesus. Later in that service, everyone was called to come up and join together as we took Communion together, all standing around the altar (which was truly a "Communion Table"). The words in the Bible describing the Last Supper became real to me that night. I have longed for that experience again on each Maundy Thursday since then. Maundy Thursday came this year. It was particularly special because Zeke had decided to take his First Communion at that service. Gwen and Tim's church is a wonderful mix of things that make it Lutheran, yet relevant and attractive to young and old alike. They do Maundy Thursday beginning with everyone sitting at tables, with bread and wine, grapes and juice as the center. Those who have decided to make this their first Communion are called to the front and asked to share why they have made this choice. I loved the variety of testimonies shared. One young man shared that he wanted to make this HIS faith rather than just his parents. Another shared the desire to be closer to Jesus. One girl talked about getting strength from Communion. Among other things, Zeke shared that he wanted to be a disciple of Jesus. So many personal reasons, shared publicly with their church family. The Pastor told the story of the Last Supper and talked about the fellowship that happened that night around that table. Psalm 51 was shared. There was time for prayer. Then the oldest person at each table - and that was clearly me - passed the bread and the wine (juice) to everyone at the table. Really a wonderful way to remember why Communion is such an important part of our faith - something that has been celebrated for centuries. It was for me, a reminder of that service long ago. I am so thankful that I got to be a part of such an important event for Zeke. Gwen and Tim have done a wonderful job of making their faith real everyday. That has translated well for their children. I love seeing these important milestones being passed down to the next generation. Most of all, I am so thankful that my grandchildren will grow up knowing and experiencing what Maundy Thursday is really all about, and knowing Jesus personally. I can tell you exactly where I was 34 years ago today, and exactly what I was doing. It was one of my first days back at my full time job and as a manager, I was meeting with all of my workers to catch up on all the new developments around the office. I had missed VERY MUCH work over the previous 6 months - spending most of my time away from work in the hospital with Doug. Just before his third birthday he had a kidney removed (February 15) and then both Gwen and Doug had gotten Chicken Pox. Ken and I had used up most of our vacation time. Thankfully, both of our employers had been gracious about the amount of time off we had needed to use. The 19th was a Thursday that year and I had been off the beginning of the week to travel to Minnesota to see my Dad, who had been very sick for many months. I remember getting off of the phone with my mom the week before, and she had simply said, "you need to come now to see Dad". So I took off MORE time from work. I am so thankful that I did. I had a chance to see my dad and say good bye. I got to hug my mom and see my siblings. It was necessary. Three days later, on this day, during that meeting, I got a phone call from my mom telling me that my dad had just died. While it was not unexpected, nothing can really prepare you for that news. I remember that I just immediately went into the mode of trying to figure out all the logistics to get my family to Minnesota to be with my mom. This picture was taken at the funeral home on the evening of the visitation. Doug was just 3 years old and Gwen was just shy of 6 years old. I was only 30. At the time, I did not understand just how much I would miss my dad. My dad had a special relationship with Ken and I know that Ken also felt the loss of my dad. Sadly, neither Gwen or Doug has many memories of my dad. Our life was so caught up in Doug's health issues and my dad had so many health issues during those same years. It was not uncommon for my mom and I to have phone conversations from one hospital in Illinois to another hospital in Minnesota. So we really didn't see them enough to make memories with the kids. I am not sure whether it was Doug's illness or my dad's illness and death that was the trigger. But I am so thankful that these events stirred in me a desire to draw closer to Jesus. It was shortly after this that I began going to a Prayer Group offered at my church. And then I joined a Sunday morning Bible Study. Because of those groups, my entire outlook changed and all of the Sunday school lessons and sermons I had heard, suddenly became real to me. Jesus became real to me. Within a few years, I found a way to only work during school hours so that I could spend more time with my kids. I left a career that was cut-throat and actually stressful, and even got fired from the last position I had in the field, BECAUSE I was a Christian! (There is a long story with this that will need to be told in another future blog). Following that, I became a church secretary. Something I did for the next 19 years! So it is safe to say, my dad's death had a profound effect on my life. It is fitting that today is Good Friday. It is a day that is marked with the separation of God the Father from Jesus his Son. And because of that sacrifice - that time of darkness, we all are no longer kept away from God. What a great gift we were given at the cross. We all can come to God because of what Jesus did on the cross for us. Even when we so far away in our sins, Jesus died for us. Because of Good Friday, I can celebrate knowing that I will see my dad again one day in heaven. It is so easy to tell people to realize the importance of family and making memories together. But on a day like today, I can't help but urge you again to put aside anything that might be causing conflict in your family. Life is so short! Time is so valuable. Don't miss out on today, because tomorrow is not promised to any one of us. Make this Easter season a time of reconciliation. A time of forgiveness and joy. Hug someone close to you and tell them how important they are to you. And celebrate that Jesus is alive! I have seen so many posts today about National Sibling Day and I was trying to figure out exactly what I wanted to share about my siblings! I decided to share this photo since it clearly shows the wide age spacing of my siblings. 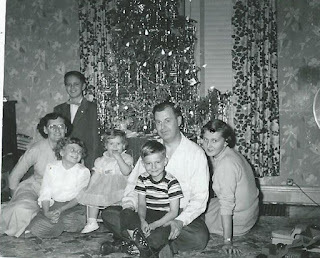 This was Christmas 1955 and I am that little 15 month old sitting on the stool. This photo was also taken at a house that the rest of my siblings would say was their "childhood" home. I, on the other hand, really don't have any memories of this house since we moved when I was just 3 years old. The house, in Watertown, South Dakota, is now gone and the lot is the current Post Office. I never got to visit that house to try to recall memories, but I am thankful for the many stories shared by my mom and siblings. So I feel as if I "know" that house. Karen - my first real memories of Karen are preparing for her wedding. I was in Kindergarten and it seemed very exciting to me. She had moved back home from college and she had lots of really amazing jewelry. Jerry - my first memory of Jerry is his Ham radio set up in the basement of our home when I was 6 years old. He had post cards around a world map from people he had talked to all over the world. Julie - I remember her "room" in an upstairs hallway when I was 4 years old. She had pictures of horses all over the wall. And she had a special doll that I was not allowed to touch! Greg - He was a cub scout and my mom was the pack leader. I went with on many trips to the hobby store and also on the many field trips they took. I remember the blue and gold banquet when I was 4.
and it was for mom's 90th birthday. It is really a shame, that as adults we did not purpose to spend more time together. I often only saw my siblings while visiting my mom! Being busy with our own families, living far away from each other seem like just silly excuses now. Sadly, my sister Karen died in 2007. And truthfully, I haven't seen my brother Greg since mom's funeral in 2011 and I last saw Jerry in 2011 at Doug and Susie's wedding. I also saw my sister Karen's husband, Roy, at their wedding. I saw Julie at the wedding of one of her granddaughters in 2015. So there you have it.... weddings and funerals. The only time that we have managed to get together. I am always kind of envious when I hear my friends talk about being together with their siblings. As a matter of fact, one of my good friends and her sister are part of my small group! It would be nice to be able to have an impromptu gathering that included my siblings. I am most sad that my siblings really don't know my children or grandchildren very well. They have only spent a limited amount of time with them. And it makes me sad to think that Lia and Ellie can not learn how to make Lefse from Karen. Or that Doug never got to talk with Jerry about Ham radio. (Doug actually had his Ham license when he was in middle school!) If Julie lived closer, she might be able to help Ellie learn how to sew. Zeke has the potential to be some kind of engineer and I know he would love talking with Greg and Jerry or Roy. And I am sad that I never had the chance to be really close with any of my nieces (no nephews- Doug was the only Grandson) and their children. Certainly a hazard of the times. So when people ask me if I am "close" with my siblings, I have to say no.... not really. I am glad that Julie and I keep in touch via facebook and phone. But again, I miss having her just across town. Or even in the same state! 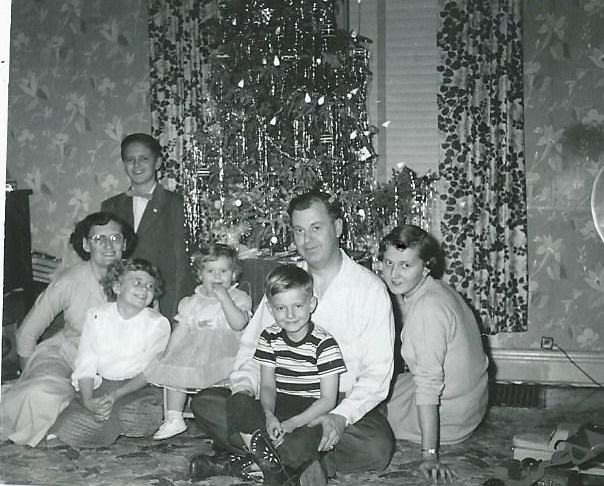 I am feeling blessed that I spent many hours listening to my mom share her stories of each of my siblings. I am also thankful that I did spend some time with each of them as an adult. So on National Sibling Day, I am feeling blessed to be a part of the family that God gave me. While my situation may seem very different than yours, I know that there is a plan and purpose for the exact family that I have. While I may not have a traditionally close relationship with my siblings, I know that there is a common heritage in each of us. Our lives may look very different, we may live in different states and have very different likes and dislikes, but we are connected to each other. Our shared ancestry and the heritage and spiritual legacy that has been sown into our family, continue into the future. Yesterday I had one of those "moments" watching Grace sit at the organ, playing her own "song". I just happened to glance up from my spot across the room, and suddenly I was remembering pictures I have of that same instrument, from many years ago. This picture is from 1976, just after Ken's dad purchased that organ. 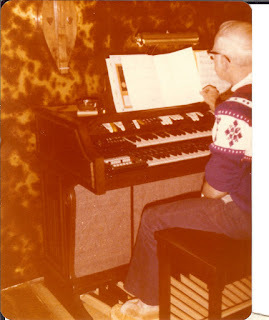 I love that you can see a dulcimer hanging on the wall behind the organ in BOTH pictures! 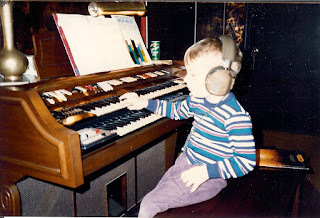 Doug actually asked for the organ when Ken's dad was moving to Florida. It has been in Doug and Susie's house, ever since. And the dulcimer hanging in Doug's house is one of the dulcimers that his Grandpa built. It is easy to see why that organ brings back so many memories for me. Both of my kids looked forward to playing it when we visited Ken's mom and dad. Of course thinking about these pictures also took me down another thought path. April is one of those months for me, that almost every day seems to hold a memory of the death of a special person. My mom and dad and Ken's mom and dad, all died in April. My sister died in April. Two of my four grandparents died in April. But today I was thinking about the wonderful heritage all of those people have sown into my family tree. Ken's dad loved music and I know that he would be so pleased to see Grace enjoying his organ. In his later years, he often told Ken and I how much he loved that both of our kids were involved in music. My dad was also a musician and he would love that Gwen and Doug both play instruments and sing. Some of my best memories of my dad are the (few) times that I witnessed him sitting at a piano playing and singing or playing some other instrument. It is interesting that I am the only one of my siblings that did NOT ever play an instrument or sing in the choir. I am very thankful that my kids from an early age, had musical talents. I love that I am seeing that passed along with my grandkids. Lia and Ellie are both playing the piano. Zeke has expressed how much he wants to learn guitar (and drums). Anna loves music and so does Grace. Even though this "musical heritage" seemed to pass me by, I am thankful that it didn't stop with me! For the rest of this month, I plan to find the wonderful heritage that each of these special people have left for me and for future generations. I love that there is so much we can learn from our ancestors when we find their connections to our present life. Sometimes you just have to stop and look for those ties that bring generations together. Suddenly April doesn't seem so dark and gloomy for me. Even though it is the month of rain and more rain along with the reminder of lost loved ones. I am going to use this time to find even more wonderful connections to my ancestors that will bring new revelations for our family.. I am very thankful that Grace decided she just had to play the organ. I guess I needed that memory jog to start on this new adventure. I can't wait to see what new things Jesus shows me as this month goes on. One of the best things about the last "school" year is that Gwen switched her women's Bible Study to Monday afternoons, when I am already at her house. This has allowed me to participate with her group, getting to know some really awesome gals, and doing great Bible studies. We just started a new short study, to take us to the end of the school year. Gwen had given all of us a couple of choices of topics, and we all picked this one. None of us knew the author, but there was something about the topic that appealed to us. Last week we listened to the introduction video. It was a wake up call for me, for sure! Annie Downs, the author, talked about her own well-worn Bible and all the notes and underlines that it contains. She even related a time when she got a new Bible and spent the time transferring all of her notes from the old book into the new one. This was something that I had done, more than one time. My current Bible is dated 8/11/04. But it contains notes and underlines going back to 1988. As I was watching Annie talk about her Bible, I suddenly had an overwhelming desire to old my own Bible and look at those notes. I couldn't wait to get home and find my old treasured Bible. It was one of those "moments that matter" for me. Yes, that is my Bible under the Bible Study Book. I have been using it since that day. I really didn't know how much I needed this particular study, not just to return to my Bible, but also for the content of the study! The core message of the study is that we need to collect the moments that matter SO THAT we can persevere through hardships and when we just want to give up. I am anxious to work through this Bible Study to gain insights and direction to just keep on, keeping on. As Christians we are not promised that life will be easy. What we are promised is the constant presence of Jesus with us. The help of the Holy Spirit for what ever we face. And the promise of eternal life with God. I am so thankful for all of the ways that Jesus uses people - to write Bible Study guides, to make videos, to gather people together, to share their own stories, to just love one another. This is another prompting for you all to find a group of people to surround and support you. There is nothing more powerful than hearing the "God stories" from friends you can count on. And this is an encouragement for you to pick up an actual BOOK! Something that has weight and pages that you have to turn. Hopefully it will be a Bible. But purpose this week to find a real book to read. Take a moment and feel the pages and even smell the book. It will bless you! For some retired people (or others that just stay at home with no children), it is often hard to figure out how to fill up their time during the day. Let me tell you, it is not a problem when you have children around! This winter has really seemed long and dark here in Chicagoland. All of us were getting a bit of "cabin fever" over the last few weeks. So this week was a wonderful break with a couple of days of almost 60 degree weather! And we even had a couple of hours when the sun was actually out! Amazing! So Grace and I actually went outside on Tuesday. It was not the warmest day this week - but it was close to 50 which felt warm! Grace picked out her hat and insisted on wearing it. You can tell that it has been really cold here! She also insisted on wearing mittens. She was still able to find some really interesting sticks and made a "display" of them on the door mat. We walked up and down the street several times and she ran around the yard. The highlight of our time outside, was a police car driving by their house. He actually stopped and waved at Grace and she was so excited. They live on a street that has almost no traffic so seeing any car go by is quite the cause for celebration. It was a much needed breathe of fresh air, hour and a half for both of us. Thursday's weather was not wonderful. As a matter of fact, it was awful! While it was in the high 50's, the wind brought a weather system blowing through that came with thunder, lightening and downpour rain. Unfortunately, the worst of the storm hit during Grace's nap time. And the noise woke her up. So she had a much shorter nap than usual. It was an indoor playtime for sure. We played with play-dough (always a favorite). She was delighted to figure out that she had two sizes of rolling pins. She spent a lot of time going from one to the other, trying out different thickness of dough. Doug and Susie got her an easel for her birthday (one side is magnetic and one side has a chalk board) and there is paper to color or paint on also. Right now she loves the magnet side. Gwen and Tim and the kids gave her the Leap Frog "Fridge Phonics" and she loves to play with all the letters. This grandma does NOT however appreciate the song that goes along with each letter. I am really tired of it. After the worst of the rainstorm was over, we did go outside. It was a very short trip, to say the least. The wind had actually blown the patio screen door right off of the house! So I needed to go out to retrieve it before it was ruined. The wind was nearly blowing Grace away. She could hardly stand up. Even the dogs didn't want to be outside. To the prize worth fighting for. The entire song made me stop and realize that no matter what 2019 has been like for me, it is so true. The love of Jesus is my reward. And because of His promises, I can stay strong and keep fighting on. And I will win the race because of the unfailing grace of Jesus. Praying this song blesses many of you who might be in the place of struggle as me. I am so thankful for new Christian artists who faithfully create new music to bless us all. Having a "sleep over" with the grand kids! I am extremely thankful that Gwen and Tim are volunteer youth leaders at their church! Not just because it warms my heart to see them serving Jesus in this capacity, but also because their times away at retreat give me a chance to stay with the grand kids. Except now that Lia is actually IN the youth program, I only have three of the kids to enjoy. Anna was just delighted that I was having a sleep over at their house. There is something fun about being there without the parents. It really gives you a glimpse at what their life is like, on a day to day basis. 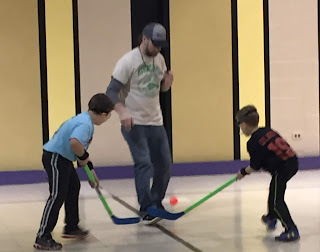 I was especially excited to have the chance to get to see Zeke play "No Ice Hockey". He only has one more game left in the season after this one. This is his first year playing floor hockey, and after watching him play, I see a lot more hockey in his future. 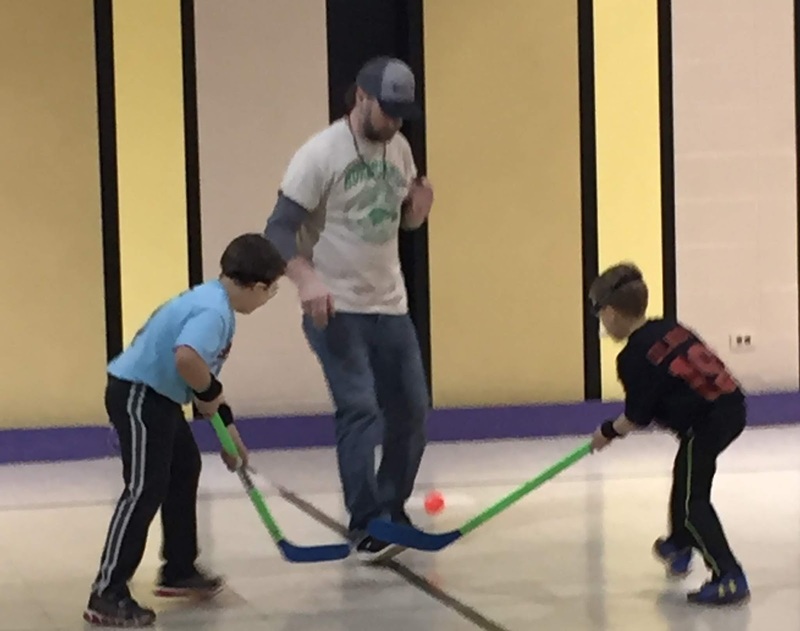 This is no surprise since Tim plays ICE hockey and has even played on adult leagues! These kids are only six to eight years old and it was amazing to see them play. During the game that I watched, the coaches did a great job of letting the kids all play different positions. 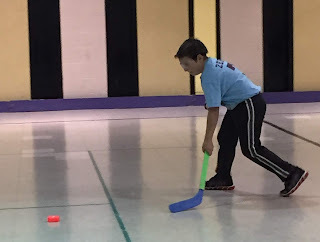 Zeke played offense, defense, and center and actually scored a goal! This was especially memorable since the team they were playing against is the number one team in the league (mostly older boys who have all played for a long time) and they have not had a goal scored against them ALL SEASON! You can be sure that this grandma was cheering from the sidelines! Besides Zeke's game, all three of the kids worked together on this 500 piece puzzle. It was especially fun since it is a camper puzzle and these guys just love camping. They talked about keeping this puzzle by coating it and framing it to hang in their camper. Here is all three kids helping put in the last piece of the puzzle. And with the finished puzzle! It was so much fun to watch the kids helping each other out and working together on this project. Such a fun way to spend a couple of rainy, cold and windy days! As part of the fun "sleep over" time, Anna and Ellie wanted to "do my nails!" So, as any good grandma would do, I allowed them to paint my nails. Anna, at five years old, is just getting used to using nail polish. She told me that it would be okay since "I don't paint on your skin anymore!" And she did a really good job on my left foot! Ellie is an old hand at doing nails, and she painted my right toes. She also insisted on putting on a top coat and making sure that my nails were totally dry before I could leave the "Salon" (the bathroom). Besides these fun activities, there were games played and forts built and of course the extra long bath (that apparently only happens when grandma is there for a sleep over). There were books read and prayers, prayed. Zeke brought me "The book without pictures" to read to the kids. Of course we were all laughing by the end. The best part about that book was that Ellie wanted to read it to us all again! So we all listened to it again and laughed some more. Ellie has dyslexia and had a difficult time learning to read. So her willingness to read a book, out loud, to more than one person, with no pictures, is really amazing. Thanks to Gwen's perseverance, Ellie's hard work, and a good reading program, Ellie is reading at grade level now! Anna asked for a "Little Blue Truck" book. And then Ellie offered to read a story to Anna in bed. Again, so amazing. Ellie and Anna helped set the table for our last dinner together, before Gwen, Tim and Lia got home. She reminded me that we should pray before our meal. Anna immediately said that she wanted to pray. Her simple prayer was for all the people on the "treat" (retreat) to get home safe, and then we prayed our family meal prayer "Come Lord Jesus". Come Lord Jesus, and be our guest. I couldn't help but reflect on that simple prayer. My mom had always said that prayer with her family before eating, and she carried it on with my family. I taught it to my children and now they have taught it to their kids. Such a simple little prayer, yet so meaningful. Inviting Jesus to be with us at our table. And then asking for God's blessing over our food and the time together. I had one of those sudden moments, remembering my own childhood, saying that prayer with my parents and siblings. And then remembering my own kids as small children, sitting in our kitchen together, praying that prayer. Such a warm and wonderful feeling of Spiritual connections across multiple generations. All through a simple table prayer. We ended our special time together, all cuddled on the coach watching a movie. It was such a wonderful end to a special couple of days.